WANTED: Wise Woman's Outdoor Intern(s) and Office Intern! These are two magical work-study opportunities for an aspiring herbalist, gardener, farmer, healer, teacher, wise woman, or green witch! The Green World is waiting for you… join us! This year, we have a LOT to do to grow our 2 herbal businesses and the New Hampshire Herbal Network! 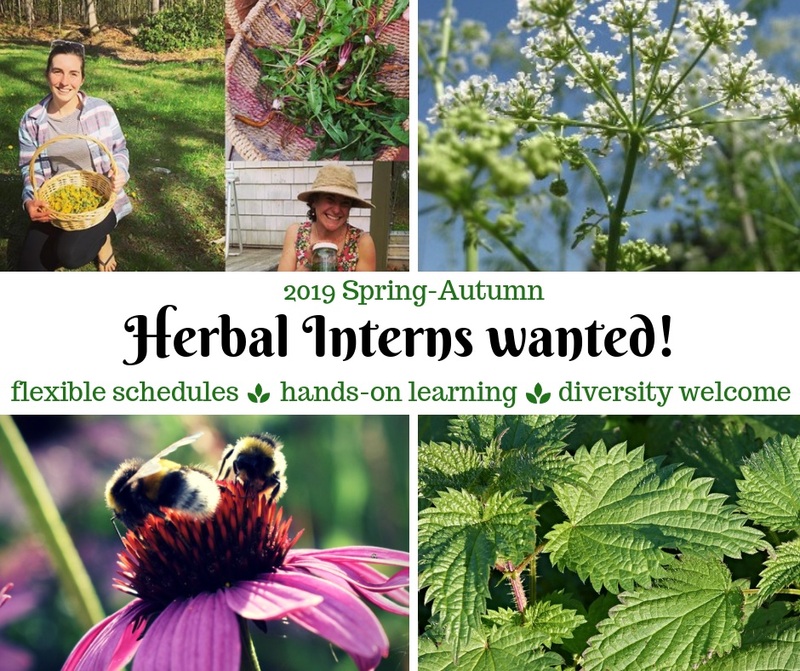 We are looking for hardworking, plant-loving people to help our herbal center grow who can commit to staying on the whole season, from the end of April to the end of September. If you can cheerfully move wheelbarrows full of compost, help us create gardens from scratch, follow directions to plant/transplant/weed/tend/gather/dry/prepare the plants diligently and lovingly, and gleefully play and work through long garden days whatever the weather, then we would love to hear from you! -clearing land/ceremonially creating space for more native/medicinal plants while honoring the plants we remove. -talking to (but mostly listening to) plants, mushrooms, etc. -labels and packaging and mailing, oh my! Are you left-brained? Can you create order out of chaos? The right assistant will thrive on mythic tasks such as compiling paper notes into PDFs, streamlining protocols and recipes, separating and organizing unruly piles of herbs into neatly drying baskets or carefully weighed bags. Do you enjoy both venturing off the scheduled beaten path to explore something new, and also have the ability to call your (and my) attention back to the original task at hand? Do you take pleasure in Getting Stuff Done AND stopping to smell (and sing to) the roses? This position requires clear communication and dedication. If you say you’ll show up, show up. If something feels awkward, bring it up. Let me rely on you to be present and grounded when I need to fly, and you can rely on me to be nurturing and supportive as you grow. Can you learn as you go? This is not a structured apprenticeship, but rather an incredible opportunity to work alongside a skilled, knowledgeable, loving Wise Woman… time will be given to make sure you understand the concepts behind the tasks, the mechanisms of herbal interactions, etc., but much of your learning will take place through conversations as we work together, recipes and articles we unearth and you catalogue, and skills I teach you as they’re needed. Can you see tasks that need doing, and do them? Are you able to receive direction and run with it independently, but not afraid to ask questions? Do you just know the world is bigger, brighter, and more magical than most of us can see? Are you willing to expand your awareness and learn to connect with Gaia in ways others might think impossible? Do you love playing with nature, blending new recipes? Think herding cats!! We move in a lot of different directions on any given day, guided by devotion to the Earth, passion for the work, and more ADD energy than you can wave a smudge wand at. Flexibility and clear communication are essential. Do you know your way around a computer- of course you do! Come document our days, take pictures, post updates and events to social media sites with flair and personality. Share with the world what we have going on! You need to be available for the full season (end of April to end of September), for approximately 8 hours a week. With advanced planning, we can be flexible with the days/times, but are primarily looking for weekday help (some weekends available). Come prepared to be outside (gloves, outdoor shoes, snacks/water bottle, rain gear, etc). -Access to a wide variety of fresh herbs and plants and an ever-changing collection of really delicious herbal foods, bitters and herbal cocktails, etc. -Attendance at all classes, group ceremonies, Wisdom Circles, and other events. -An amazing herbal education through osmosis! You will learn how to identify, gather, and prepare herbal foods, remedies, and medicines, what different herbs are useful for and how to intuitively blend them. You’ll learn about the behind-the-scenes magic and tasks that keep a working apothecary running. You will learn how to identify, forage, grow, and prepare delicious and healthy foods from nature, such as sauerkraut, natural sodas, bitters, et. You will quickly start building your own home apothecary, bar, and kitchen witch foods, making medicines for your friends and families, and healing yourself! You are on a sacred life journey, and part of my job is to act as a guide and mentor, supporting you as you grow and develop your own unique skills and passions! I will teach you, laugh and sing with you, but I will also challenge you to grow and learn in ways that will not always be easy - and it will be up to you to do the work. Stick with me long enough and you’ll learn to dowse, feel energy in the Earth, communicate with plants and mushrooms, practice sacred journeying and meditation, and many other intuitive, magical, and practical skills. You will come out of this more witchy, grounded, wild, and whole than you ever thought possible, and the blessings you learn will be with you for life. It won’t always be easy, but it will be fun, exciting, and intensely rewarding. This is excellent hands-on opportunity to explore one of the many ways you can incorporate herbs and sacred healing into your personal life and potential future business. If your soul has been calling out for a chance to live your own fairy tale, then you may have just manifested yourself an opportunity! Email info@blackbirdsdaughter.com and tell me a little bit about yourself, what draws you to the position, and why you believe you are the assistant or intern I’m summoning. Please include a resume and phone number. If called for an interview, you will need to speak with a current Intern and provide 3 letters of reference. Position open until right candidates are found.